For all books in this series: Go here. Recommendation: Certainly a thriller to read with easy pace and no unexpected twists. 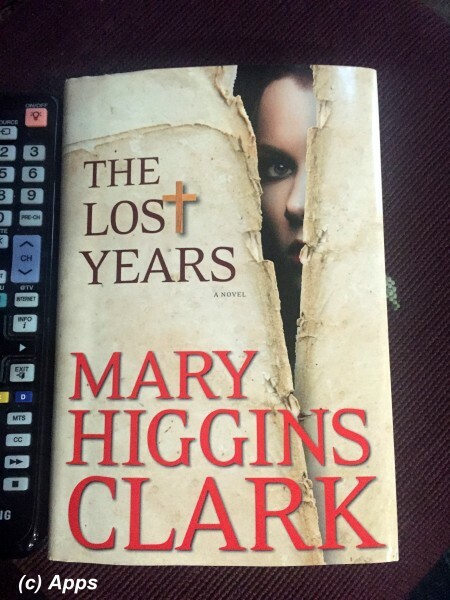 The Lost Years is a thriller by Mary Higgins Clark published in April of 2012. The author touches on the very strong subject of Dementia that is rarely broached and a syndrome often confused with Alzheimer's Disease. It also has a biblical touch to the plot, which is new for Mary Higgins Clark too. For once I couldn’t come up with a song for her title - perhaps this is indeed different from her usual novels. I had not known thus was another Alvirah and Willy Meehan book and only had realized when Father Aiden's character came into light. I felt a spurt of disappointment to pick another of her book, but I always give benefit of doubt for any book. So, my review again on another of Alvirah series. The plot begins in 1475 A.D. in the Bibliotheca Secreta, one of the four rooms of the Vatican Library in the then Rome. A monk is given a parchment to be kept hidden and safe by the assistant librarian. The parchment is supposed to be the only letter Jesus Christ has ever written and it was addressed to Joseph of Arimathea to thank Him for the help he had given for eighteen years of His young life. The then Pope, Sixtus IV, did not believe this to be an original letter and was set upon destroying it. Hence the need for it to be hidden somewhere safe. Now 500 years later the parchment becomes the topic and comes to light. Forward to 500 years and we are in the present time and traversing through the life of Mariah Lyons and her family. Mariah's father, Jonathan Lyons, has been murdered and her mother, Kathleen Lyons, was found huddled in a closet with a the gun that killed Mariah's father in her hand. Her mother suffered from Alzheimer's and had been getting worse as days went by. Who wanted to kill her father? Did her mother kill but forgot? But she remembers the affair her father had with Lillian. Had she shot at him in a rage when she had the few moments of lucidness? Detectives Simon Benet - from the Bergen County Prosecutor's office - and his partner - Detective Rita Rodriguez are assigned to the case. In the course of their investigation they find that prior to his death Jonathan was translating some documents for an old church and he had found a valuable piece of manuscript - a letter supposedly written by Jesus Christ to Joseph of Arimathea. Father Aiden O'Brien also mentions that her father had a premonition that he would die and that he had discussed about that parchment with a few friends, of whom one had propositioned to make money by selling it to top bidder. Who amongst the five closest to her father wanted to do this? Was that person desperate to get that parchment that he/she killed her dad? In the midst of all of this, the next door neighbors Lloyd and Lisa Scott are robbed of their safe. Then police arrest Kathleen charging her for murder of Jonathan. As the painful process of uncovering the truth by Mariah proceeds, she comes across a lot of people that she considers have had valid reasons to murder her father and some she comes across who stand by her side and help - Rory Steiger (caregiver for her mother Kathleen), Lillian "Lily" Stewart (the professor at Jonathan's college with whom he had been having an affair for a long time), Betty Pierce (their housekeeper), Richard Callahan (friend of Jonathan and a professor of Bible studies at Fordham University), Charles Michaelson (a friend of Jonathan and a professor), Albert West (a friend of Jonathan and a professor), Greg Pearson (a friend of Jonathan and a successful businessman), Father Aiden O'Brien, Lloyd Scott (neighbor to Lyons and defense attorney to Kathleen) and his wife Lisa Scott (Former model and a jewelry designer), Delia Jackson (Their weekend caregiver for Kathleen). Alvirah again jumps into the situation to help find who killed Jonathan, what happened to the parchment an also get Kathleen released. Will she be successful? Who killed Jonathan? A decent thriller and for once Alvirah was actively involved. But what bothered me was the fast-speed way that the cops arrested Kathleen Lyons and also incarcerated her even though she was suffering from dementia for quite some time. Shouldn’t they be checking her medication and perhaps have a conversation with her doctor before deciding if she indeed committed crime? It was appalling to see the author portray the cops and prosecutors in a one-minded way. She should have left with keeping Kathleen Lyons as one of the suspects as opposed to actually incarcerating her. And this time I could guess who the actual killer would be mid-way through the plot. It was getting predictable from there on. All in all a good thriller to read for those lazy days with no unexpected twists and easy pace. 1) The biblical reference to the only letter by Jesus Christ to Joseph of Arimathea has some credence to it. However I couldn’t find any legitimate evidence that this even exists. However a very nice theme for the plot.